Today I have a special message of thankfulness to give, and this one is to our nurses. With our frequent flier miles at the hospital, we get a chance to meet and test out most of the nurses here on the pediatric ward. I know a majority of them…mostly by first name. But today, this blog post is about them. I am thankful for them everyday…especially this week. Not making me feel like a bad mother for wanting to not be in the room when medicine is given. When a little kid’s throat is sore, taking medicine is a form of medieval torture, no matter how necessary it is. I can be the bad guy when I have to be, but appreciate the breaks occasionally. Talking to me like a mother, not a child or a doctor. When the doctor says, “We’ll talk about going home once he starts drinking.” And the nurse letting me know that with 2-year-olds, we could be here a bit. Letting me know what’s normal. The above mentioned issue of not drinking? Guess what? Completely normal. Taking care of one of my most prized possessions. That includes: reading his history, understanding my concerns prior to coming in the room and going above and beyond to do what is right for George. No matter how you look at it, all of the nurses here are pretty much amazing. And one day, when George is big and strong and a no longer eligible for the pediatric ward, I hope to come back and personally thank each one of you, for your crucial part in our journey. But for now, a simple “Thank you” will have to do. What gets George through a hospital stay? 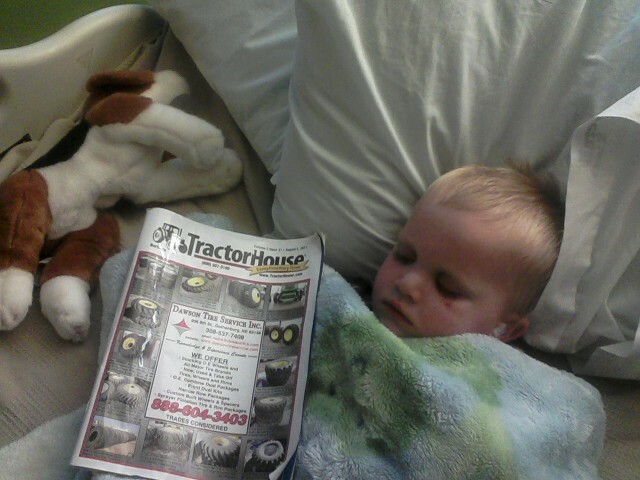 His puppy, his blankie and his tractor magazines! This entry was posted in Doctors, Medical mystery, Medical road trips and tagged children, hospital stay, medical road trips, nurses, nursing, ornithine transcarbamylase deficiency, Thankful Thursday by wagfarms. Bookmark the permalink. Isn’t wonderful when someone you have never met, treats you and your loved one so great. It takes a special person to be a nurse. I have a daughter with the same problem and she is now 3 years and 9 months and the doctor told that she needs to have tonsilis and adenoids removed… I have been postponing it up to now. You are brave! It’s not fun, I’ll admit…but George spends enough time in the hospital, if we can elminate some of these stays and lower his chance of getting strep infections…well, I felt it was something we had to do. Not only that, but his tonsils were so large, he would put his fingers in his mouth to try to move them out of the way. We just need to get through these next few days! Good luck!